The 'P' Class sloop Elvira was built by the renowned Patchogue boat builder Gil Smith, for Harry A. Walton, and launched June 9, 1906. Walton family members William and John, who were founders of Bellport Bay Yacht Club in that same year, were no doubt pleased on the breezy Saturday of August 4, 1906, to see Harry at the helm as Elvira became the first boat to cross the finish line in the yacht club's first race. Unfortunately Harry, probably tying to compensate for the fresh southwest wind, had taken on extra crew after the start and was subsequently disqualified. 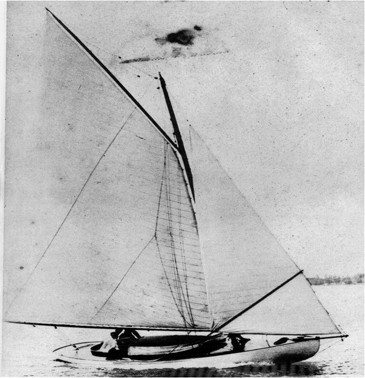 Though Harry and Elvira continued to race successfully on Bellport Bay they met increasingly strong competition, particularly starting the following season when brother William (Willy) Walton had Gil Smith build a slightly larger, and faster P-class sloop, the Bee. This fine vessel was later sold to the venerable Commodore Paul Bigelow who campaigned her successfully through the 1920's. Elvira eventually passed to the Starke family who sailed her with much pride and increasing acclaim as over the years as she gradually became the 'last of her breed' to survive. 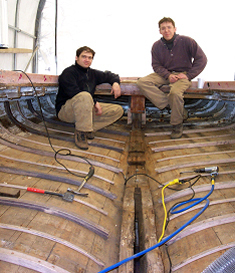 Professional boat builders Ricardo Vicente and Joshua Herman surveyed Elvira in October 2005 and laid out the plan of the work to be done. Ricardo and Josh's recent major project had been leading the restoration of the oystering sloop Pricilla for the Long Island Maritime Museum. It was decided that because Elvira had been covered with fiberglass cloth and had experienced many modifications and repairs over the years, she was not a cost effective candidate for full restoration but could be refurbished to sailing condition, which was Bob Starke's original hope. They estimated that the job would cost about $40,000. in labor and about $10,000. in materials. The Carmans River Maritime Center's Board of Trustees voted to have them begin the project which started in November 2005. Ricardo and Josh, as professional boat builders, are fast workers. And in short order they had removed all the damaged frames in the way of the cockpit, many of which were so deteriorated that , as Ricardo said, "We just vacuumed them out of the boat". They then steam bent in new frames of white oak, alternating thick ones and thin ones in the Gil Smith tradition. These were fastened with copper rivets and they went on to use stainless steel screws to refasten all the other frames that were still sound enough to remain in the boat. Along the way a number of discoveries were made. Elvira's planking is generally quite sound and her fiberglass 'skin' (put on with epoxy resin which was very 'high tech' for the 1950's) is still well attached to the planking and thicker and stronger than initially anticipated. On the bad news side the keel was found to quite deteriorated and had been compromised by a former engine installation. Overcoming this necessitated removal of the centerboard trunk which will need to be replaced with a new one. Ricardo and Josh have saturated the keel with penetrating epoxy in preparation for adding an oak 'cap' inside and laying up epoxy and fiberglass 'girders' along the garboards outside to strengthen the keel. This will be followed by replacing the bracing between the frames and the deck beams, removing the combing, covering the deck with a new plywood and fiberglass 'skin', building and installing a new certerboard trunk and rudder , replacing the floors, steam bending in a new combing, etc., etc. As you can see, a lot of work has been accomplished and a lot of work remains. The Future: Clearly the Elvira 100 Club, and matching grant from Post-Morrow Foundation, have done what we intended, jump started the program so that we might finally get Elvira sailing again. But equally clearly, these funds can only take us half way. We are seeking grant money from a number of sources to bridge the gap but, as you can imagine, this is slow in coming and will arrive too late to accomplish our goal of having Elvira sailing for her hundredth anniversary. So we ask you, friends of Elvira, if you know of any sources of funding or substantial donors that you might solicit on behalf of the project, please do so. We will be happy to follow up and support you with whatever information you might need to facilitate this effort and we all will be most grateful for your help. In the meantime the work has temporarily switched to a strictly volunteer enterprise with our professional boat builders prepared to provide their expert labor and guidance on a per diem basis as additional funds become available. Many of you have given generously of your money, and we can always use more of that. But what we really need from you now is your labor. We have had a few volunteers who have given of there time but we could use a lot more. There are many tasks almost any of you could help out with and Ricardo and Josh are experienced in laying out jobs for amateur helpers to make a significant contribution to a project. So call, e-mail us, or stop or stop down and volunteer. Bring a friend or family member. Be a part of bringing an historic nautical treasurer back to life.